The Tether Tools Vu Booth is a quick, easy, and inexpensive way to create a photo booth for events, weddings, or parties. Designed with the on-the-go photographer in mind, the Studio Vu PhotoBooth System serves many photo display needs, travels easily, and will not break the bank. The Tether Tools Studio Vu-2 Photo Booth is a quick, easy, and inexpensive way to create a photo booth for events, weddings, or parties. Designed with the on-the-go photographer in mind, the Vu Booth serves many photo display needs, travels easily and will not break the bank. 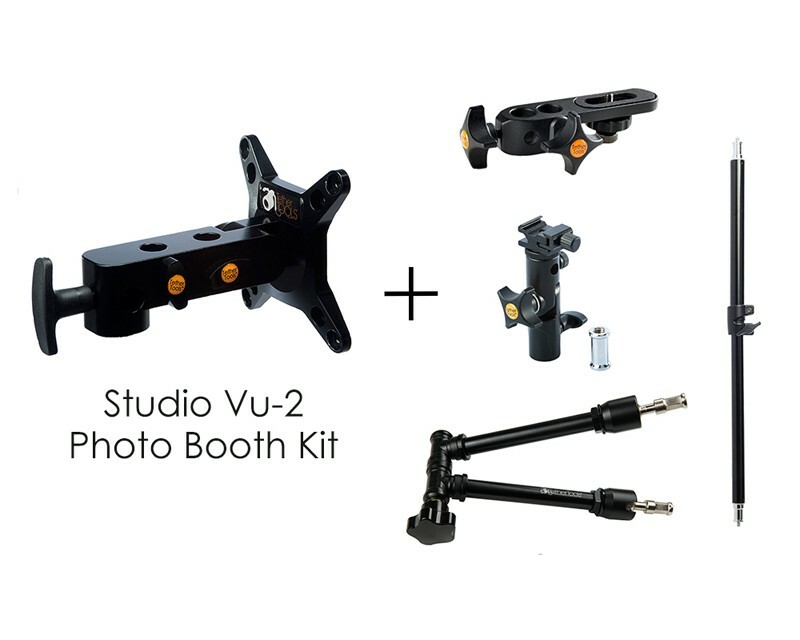 The Vu Booth Kit contains the one Studio Vu monitor mount, Rock Solid Master Arm, Rock Solid 22″ Telescoping Arm, RapidMount Cold Shoe Baby Elbow Speedlite Mount, and Camera Mounting Platform. The Studio Vu-2 is rated to hold equipment up to 80 lbs(36.5kg), however, always refer to maximum load limits on stands, arms and clamps. Those weight limitations ALWAYS take precedence. For larger monitors always position the display over one of the stand legs. The use of a sandbag on the leg opposite the monitor is recommended. This listing is for the Studio Vu monitor bracket attachment only. All other items pictured are sold separately.